This question cannot be determined definitely. If we ask about "sound", do we mean the same-named Basic command, or - more possibly - what we understand as "good sound"? In this case we probably have to start with the AdLib-card. But in order to understand about why this card found its way to the market, we'll better start completely at the beginning: with the PC Speaker. Sampling has almost exclusively been done on a Soundblaster Live! 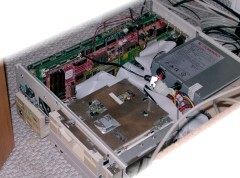 5.1, which works in an 1 Ghz Athlon machine, while the tested cards were in a 486 DX-40. The data of the PC Speaker was passed over the detour of an AWE32 to the Live while both OPL-Playback as well as the MIDI-Playback of the AWE32 were sent digitally to the Live and were equalized after it (more on this trick on the AWE32 page). The sampling ran with 44.1 Khz, which was converted from 48 Khz (The Live uses this fixed frequency internally) in favor of the better compressability for the Web. The Roland SCC-1, that I don't possess unfortunately, was recorded by Eike Belgardt. Thanks for this! The samples are offered in the formats OGG and MP3. Playback should be possible with Winamp, VLC, and, of course, with your browser. A small hint when reading: the history of each specific sound cards is more or less written in one piece. Whoever would like to read it this way may jump over the samples and technical details. A summary of the samples for direct comparison is moreover also on the last page, before the glossary.